Does this impact this issue? Hey Claude! I'm checking on this for you; I'll let you know what I find out! every time I am trying to add facebook page to zendesk and it said the account doesn't admin any pages. The facebook account did admin pages, and not just one. Issue when sending message, just started . It was working fine before . Now there is an error in read that cannot send the message to the chat. We receive messages fine. is there a plan to make it possible to add attachments to public answers? I don't believe there's a way to have attachments in Facebook posts - is that what you are asking about, or have I misunderstood your question? We notice that posts to facebooks add are not submitted as tickets? How can we change that so we will have all posts on Zendesk? Can you give some more detail on what's going on? Do you have the Facebook channel set up? Can you tell me what your settings are currently? What kinds of posts aren't being created as tickets? I have setup the facebook channel. I've added now also the hidden posts, but the posts I didn't get as tickets were posts to adds that we targeted only some of the audience. Hello, quick question please, how do we use the option to reply to a public message with an inbox in zendesk? 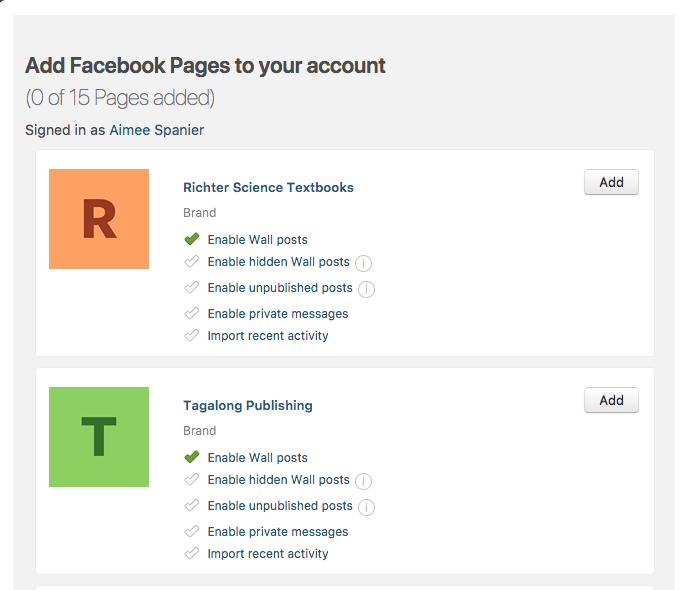 The option is there on facebook (see image) but I can´t find it on zendesk. This basically lets you respond to a public comment with a private message (through facebook messenger). Thanks! There's no way to reply to a public message via a private message with our FB integration currently. This is functionality which we do not currently have available as it's something which we haven't yet built into the integration. You're welcome to submit a feature request for this in our Product Feedback forum here. I have a similar question to Yael's above. 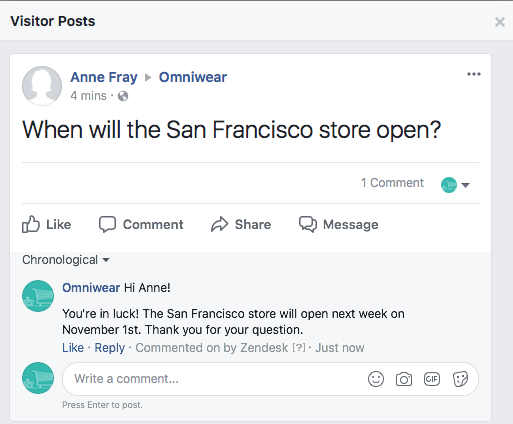 Are the only types of content that create Zendesk tickets, direct posts to your Facebook page or when someone @'s you in a post (not comment)? 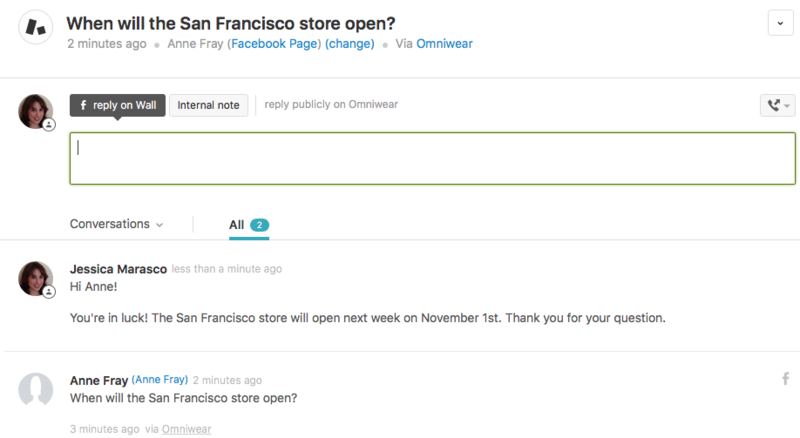 What about comments on Facebook Ads or organic posts or direct messages? e.g. we run an ad promoting a sale, someone comments on it or we post about a sale, someone comments on it, do these get created as tickets? I'm looking for a holistic solution to avoid having to manually monitor Facebook and trying to determine what already got responded to via Zendesk and what didn't. Ideally, all user comments and messages would flow in as tickets. At the moment, yes, those are the only types of posts that create tickets in Zendesk. There is currently an Early Access Program (what we used to call a "Beta") running for FB ad comments. Would you like me to see about getting you added to that? @Nicole, yes that would be great. Could you email me the details? I'm checking in with the product manager and will reach out to you via a ticket once I've gotten more details on the beta. Look for an email from me in the next day or two. If we need to move a user's comment to their own ticket, can the user access that new ticket if we're using SSO with our own portal? Would this only be possible if they create a Zendesk account with their Facebook account? What functionality does a Facebook created end-user possess? Hi Nicole, we'd like to be added to the Facebook Ads integration EAP as well, please feel free to email me about this. Your customers can log-in to your Help Center to view and update their tickets if you're using Guide Professional or a Legacy plan. If the option to allow end-users to sign-in with Facebook is enabled in your account, users can use their Facebook account to sign-in to your Help Center. If the second ticket you're creating is using the user's email address as the ticket requester and the first is using the user's Facebook profile, a new user will be created in your Zendesk for this email address if one does not exist already. When signing-in to the Help Center with Facebook SSO for the first time, end-users are prompted to enter their email address. If the user is able to verify their Zendesk password for this address, the two users are merged into one profile — this allows the user to see tickets requested from their Facebook profile or by that address. If the user is unable to complete this step, an agent can manually merge the duplicate profiles. You'll find more information on how Social SSO for end-users works here. I hope this helps! We're happy to help if you have any other questions on this. I didn't see (or may have missed) a response to Raphael's comment last year - can anyone confirm? The functionality Raphael mentioned isn't currently available with the Facebook integration. I would recommend posting your detailed use case over in our Product Feedback topic to ensure that our Product Managers see it! It seems on my zendesk account that when a customer includes an image/screenshot, our Support team can't view them without their own login to facebook. For security, our support team doesn't have direct access to our facebook messenger or the ability to post as our company on our fb page. Such access is given to them via zendesk. Is there a way to give them access to images sent via private messages directly within the zendesk ticket? Sadly this is not possible. In order to access the images the Agent would need to have a Facebook login. Facebook is a Plain Text channel in Zendesk, and as such unless it is viewable through Facebook itself which would require logging in, the agent would not be able to view. Hi I would like to ask that, our fb page is about app, and it was added a new section "review", it's possible to add the comments in zendesk too? to deal the reviews on FB is really hard and ineffective. Is there any update or workaround on the personal fb settings regarding 3rd party apps not receiving messages via zendesk ticket? I came from using SnapEngage and there were zero issues with their software. Snapengage was chat software, so maybe that is the difference. I did not see a way to do FB messages other than as a ticket thru ZenDesk. At present the Zendesk integration unfortunately does not convert reviews into tickets, and there are currently no short term plans to implement this feature. @ Meghan, can you explain what you when you say no 3rd party apps receiving messages via Zendesk Ticket? We currently support three languages (English, Spanish and Portuguese) and we have three different Facebook profiles where we received PM messages that integrate into Zendesk. however, the language does not get imported and and defaults to English. We're currently converting most of our macros to dynamic content and will often need to go into each ticket profile, flip the language and then re-apply a macro. Is there a way to import the language from the get go.